Seal-Spout manufactures the highest-quality plastic pour spouts for paperboard packaged products. Simply stated, consumers love our spouts because they are easy to use and don’t leak when the package is knocked over. Manufacturers love them because they are inexpensive and enable them to shop their cartoner, and their customers love them! Packagers love them because they are from Seal-Spout, the leader in spout manufacturing and spout insertion. Our plastic pour spouts preserve the contents from contamination, moisture and accidental spills; they are FDA approved for food products and have a long history of consumer-friendly use. They can be used for a wide range of applications, including: rice, salt, fertilizer and more. Our plastic spouts do not interfere with metal detection machines. They can be manufactured in a wide variety of shapes, sizes and colors. 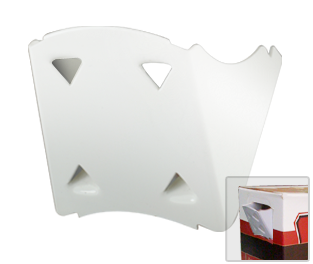 Our spout engineers can customize plastic pour spouts to match your product’s packaging. Seal-Spout spouts and spout inserting machines are the most cost-effective packaging solution, with spouts costing about $.01 per carton, depending on the application. Seal-Spout’s “Original” Pour-Spouts® allow for a clean controlled pour every time. Speak to a pour spout specialist today for a quote!